Samford University’s motto—For God, For Learning, Forever—“says what we all should do no matter our journey,” graduates of the Brock School of Business were told by a highly successful businessman and alumnus who continues to be involved in the administration of the university. William J. Stevens, whose 37-year career with Motion Industries before his retirement March 1, 2015, included director of human resources, president, C.E.O. and chairman, shared his “Samford story” at the request of Dean Howard Finch, who to him is a ‘role model’ for business graduates. Stevens’ Samford years began mid-way through his freshman year on a basketball scholarship. Alabama Christian College in Montgomery had offered him his only scholarship to play basketball and he had taken it. However, Samford’s basketball coach, John Edwards, called, offered him a scholarship, and Stevens transferred and played for 3-1/2 years before graduating. “I will always be thankful for the call from John Edwards,” he said. “Samford was a key part of my preparation for life, not only with my degree, but the exposure to Christian educators and supporters” he said. It was while a student at Samford he met and later married “the love of my life,” Kimeran. They graduated together in May, 1970. In fact, their wedding was one week after graduation on June 6, to which he added “so next month we will celebrate 45 years of marriage. “Our Samford connection is broad and we are grateful,” Stevens shared. He listed the members of his family, in-laws and offspring who were graduated from Samford. “Our family has been touched and blessed by this place; our blessings have continued because of this university we love,” he said. “Our wonderful people worked hard, accomplished organic growth along with key acquisitions,” he noted. The company now has 570 locations with branches in 49 states. Sales were approximately $250 million when Stevens joined the firm and last year grossed $4.7 billion. Stevens praised the Brock School of Business for developing a Management Program to aid in the development of its students. He should know due to his involvement in the university the past several years. 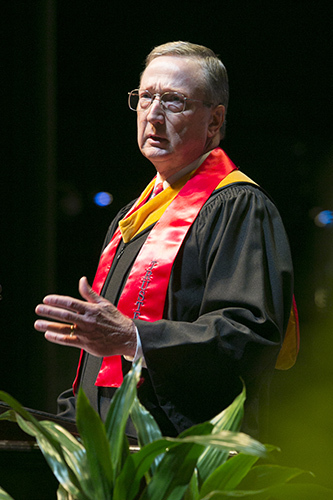 He has served as a trustee, including Chairman of the Board, and on the Advisory Board of the Brock School of Business. “God has enabled me to be a part of wonderful teams at Samford, Motion Industries and other places,” he said. The business school awarded 121 degrees during commencement, including 83 undergraduate and 38 master’s degrees.